Classic margaritas that have a “slushy” texture are perfect for a hot summer day! Especially here in Houston! However, it can be made on the rocks by mixing the ingredients and pouring over ice. It can also be made as a frozen margarita by adding more ice. 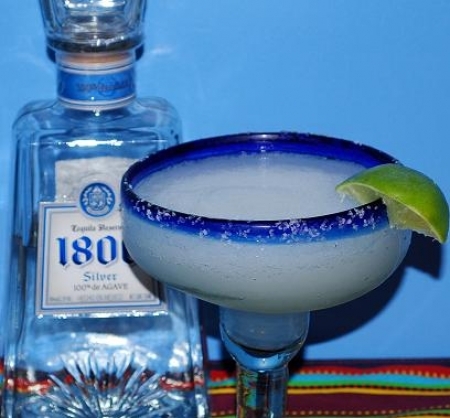 Do spend a little more on the tequila because you are making a margarita from scratch. It is worth it! I highly recommend one that contains 100% agave. Try to get limes with thin skin, because they usually are juicier. Also roll them on the counter with the palm of your hand to yield more juice. See my recipe Simple Syrup if you would like to make your own simple syrup. Place all ingredients except for garnish in a blender and blend until smooth. Place kosher salt onto a small flat dish. Smear squeezed lime around the rim of the margarita glass in order for the salt to stick to it. Salt the rim of the glass by dipping the rim into the salt and moving in a circular fashion until evenly coated. Pour margarita into glass and garnish with a sliced lime.